Our monthly Newsletter Bulletin is available for download as a PDF. Simply click the download links, below. Our first Kallah overseen by The Kallah Project, who also offered us a generous grant which allowed us to host this retreat weekend, was a huge success. Forty-one people attended including four families with young children. We enjoyed innovative worship services with lots of music; a variety of group activities, time to rest, time to play, a bonfire with music and a Tikkun Olam project to end our wonderful weekend. Although the weather was not very cooperative, we still managed to have fun, build community, eat well and enjoy Shabbat in a beautiful, relaxing setting. 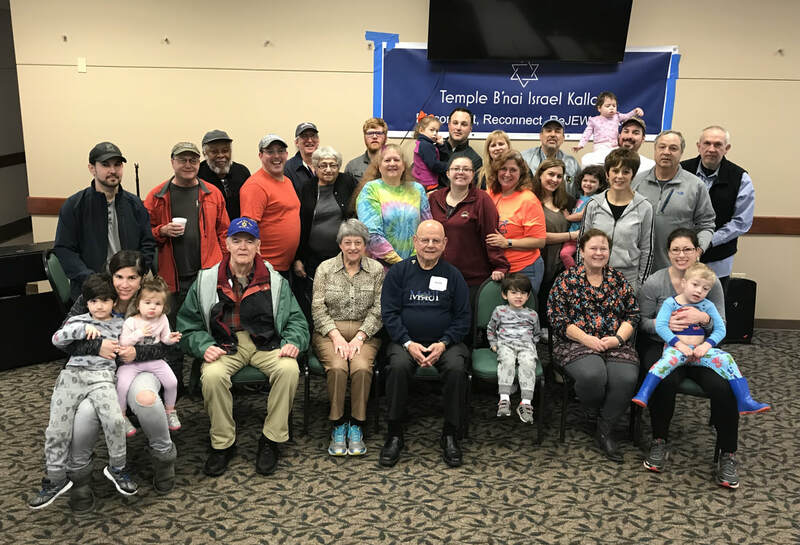 We hope that more people will join us for our 2nd Annual Kallah, April 5-7, 2019. We appreciate everyone who took time to fill out an evaluation last year. Please let us know if you think of anything else that would help to make our Kallah even better this time. And, if you would like to offer to help with the planning, let Susan Marx know. Thanks to our planning committee: Rabbi Judy, Susan Marx, Deb and Brianna Roa, Yvonne Stephan, Sandra Blate, Kelsey Laudenheimer and GayNell & Alan Barth. Registration forms are available at the Temple or you can register using the link below. If you have any questions, please call the office at 318-387-0730. Membership is open to all men. Meetings are held every other second Sunday of each month at 10 am, except in the summer. Members take turns providing a brunch for each meeting or eat at a restaurant. The meetings are very informal and fun. Our youth group, MONTY (MONroe Temple Youth) and NFTY (North American Federation of Temple Youth) offers opportunities for our teens to become healthy, responsible, caring Jewish adults by encouraging: Support. Empowerment. Boundaries. Expectations. Constructive Use of Time. Commitment to Learning. Positive Values. Social Competencies. Positive Identity. IT IS THE MONTY GOAL for young people to be afforded the opportunity to develop as many of these assets as possible while interacting with Reform Judaism. IF YOU KNOW a Jewish High School Freshman, Sophomore, Junior or Senior – and believe they will benefit from becoming a MONTY member – WE WANT TO KNOW! Email 1868Temple@gmail.com. We would consider it an honor to have you join us! Sisterhood strives to be an inclusive community for the women (Jewish or not) who care about and support Temple B'nai Israel and the Jewish Community. Sisterhood is open to women who are married, single, divorced, widowed and with or without children. While Temple membership is encouraged, it is not required for Sisterhood membership. Each woman's thoughts are invaluable in shaping Sisterhood into an organization which truly represents the entire community of women. We are active members of Women of Reform Judaism. Join us as we foster Jewish education and leadership, building a community within our congregation and throughout the world.